President Trump says Republicans will pass "a great health care package" after the 2020 election. President Trump, bowing to political reality, says he is putting off his thoughts of finding a replacement for the Affordable Care Act until after the 2020 election. In remarks to reporters Tuesday, Trump said, "I wanted to put it after the election because we don't have the House." But it became clear that he didn't have support for a replacement to Obamacare in the GOP-led Senate, either. Senate Majority Leader Mitch McConnell, R-Ky., said he "made it clear to [Trump] that we were not going to be doing that in the Senate." Asked whether there were differences between him and Trump on the issue, McConnell replied succinctly, "Not any longer." McConnell recounted that he had a "good conversation" with the president on Monday and pointed out "the Senate Republicans' view" that working on comprehensive health care legislation with a Democratic House was not something his party planned to do. 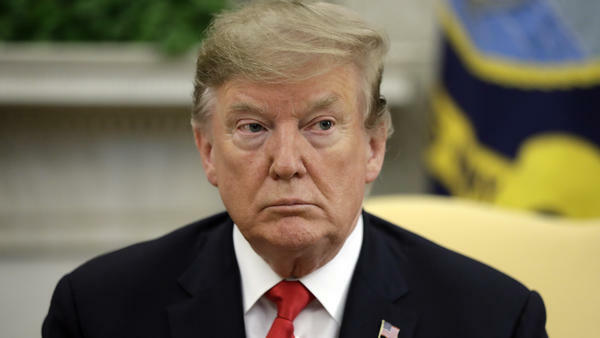 Trump surprised Republicans last week when he said he was going to make the GOP "the party of health care" and would revisit the issue that has frustrated Republicans and helped deliver the House to Democrats in the 2018 midterm election. Even with GOP control of both chambers of Congress prior to that, Republicans were unable to agree on a plan to replace the ACA — something McConnell noted on Tuesday. Senate Minority Leader Chuck Schumer, D-N.Y., said Trump's reversal means he will "hold Americans hostage through 2020" on an issue that affects millions of people. Schumer said Trump "insists he has a magic plan that we can see if only the American people re-elect him." The administration continues to push for a court ruling that would invalidate the entire ACA, and it's unclear what would happen if the courts were to rule in the president's favor. Democrats have introduced a nonbinding resolution in the House that would tell the administration to drop its challenge to the law.